Cancellations will result in a $75 processing fee. No refunds after September 15, 2019. Jan Norsetter is an award-winning oil painter known for vibrant landscape paintings in plein-air and evocatively detailed studies in still life. Norsetter also practices the decorative art of rosemaling, using skill and an artist’s sensibility to embellish items traditional and modern in an age-old form. 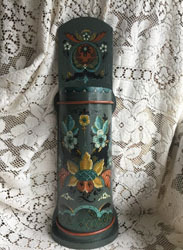 Jan was awarded the Vesterheim Gold Medal in rosemaling in July, 2018. 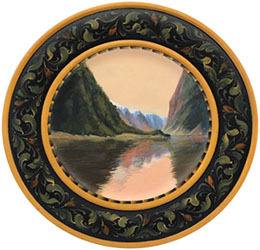 In addition to her work as an artist, Norsetter teaches landscape painting and rosemaling. Jan paints in plein-air (painting in the open air) to imbue her paintings with a sense of place. She works outdoors in every season, painting close to home in Wisconsin and on travels in the United States and overseas to Italy, Ireland, Scotland, France, and Norway. She has exhibited in more than 40 juried, collaborative or solo art shows. Selected paintings, prints and her rosemaling are in many permanent and private collections across the country and Europe. Awards include top honors in numerous plein air competitions and rosemaling exhibitions. Geieranger Fjord Scene with a Running Border of Acanthus Scrolls. Jan will offer other Border Color Variations to the Students. 10” Double Beaded Rim Plate. This project will be taught in Acrylics. Pam Rucinski has been rosemaling for over 25 years. She has studied with most of the American Gold Medalist and Norwegian Master Rosemalers. She received her Gold Medal from Vesterheim Museum in 1995. Pam has been teaching Rosemaling locally through the Fox Valley Technical College for many years. In 2003, she received the Instructional Excellence Award for her teaching from the College. She has taught numerous times at Vesterheim, as well as nationally and internationally. She is also the co-author of two Rosemaling books: Rosemaling, Trends Traditions and Beyond, Vol. 1 and 2. Pam has worked closely with the Wisconsin Arts Board for many years in various capacities teaching and fostering Rosemaling. Pam will teaching a Valdres Design on a Half Round Wall Pocket (approx.. 18” x 6”). Actual project is still in the works and will be taught in Oils, but you can choose to paint in acrylics. Painted Project will be posted soon.